The Thursday Interview: Suzanne Spiegoski. Today I'd like welcome Suzanne Spiegoski, author of “The Fisherman’s Lily” to The Thursday Interview. Before we get started, a quick intro! Suzanne Spiegoski’s work has been published in the Michigan State Press, Complex’d, L'Oeil de la Photographie, Westfall Music Group, Figure Skating in Harlem and Backstage. She grew up in Los Angeles and Detroit, and has a B.A. in Criminal Justice from Michigan State University. She is also a photographer and professional figure skating coach. She lives in New York City with her husband and German Shepherd, and is currently working on her second novel. 1) Would you break the law to save a loved one and why? Certainly. If breaking the law is what was required to protect and in turn, save the life of someone I love then absolutely, with no excuses and no apologies. If one wants an enriched life, one should go and seek it out not sit around waiting for something to happen to them. Ever since I could write, I’ve always felt compelled to. I’d like to consider creative minds are rarely tidy. Being able to unload and de-clutter some of the mess in my head with words is like oxygen for me. I can’t live without it. Writing is as essential to me as the eye is for a photographer, or the voice for a singer. This isn’t really for me to decide however I really do hope the sole purpose for wanting children, and still to this day is the most difficult concept to put down in words, is love – the act of love. Perhaps a fraction of some do because of social conformity, perhaps people think it’s “the right thing to do” in the next stage in their lives or maybe their biological clock is ticking, or some need a void to fill, a marriage to save, a family to replace… or maybe we all want to leave a part of us behind and with that, we will live on forever. 5) What was the biggest challenge in creating your book "The Fisherman’s Lily"? Definitely the gory scenes (you’ve been warned! ), but I really like the challenge of writing what I’m afraid of. My writing can sometimes get very dark, even for me! I believe it brings out other challenges I may not have known were there and in the end, am rewarded for facing my fears. Writing is probably the most challenging relationship I have of all since the battle is within myself, and because of it, I can honestly say I’m constantly changing and growing as a person, and hopefully in hindsight, for the better. Wow.. so hard to choose only one! I have learned many important life lessons but one for sure would be learning how to let go. It has always been a constant struggle for me since I’m pretty hard on myself but like everyone else, I’m a work in progress, and am always trying to be more accepting and easygoing. That can be tough for someone who is fierily passionate about many things! 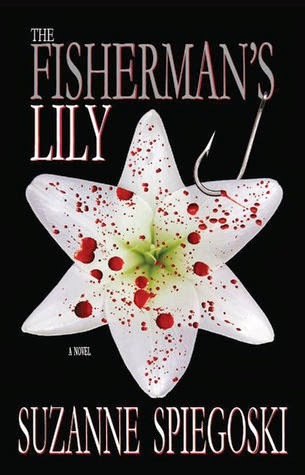 7) How did you come up with the title "The Fisherman’s Lily"? In regards to my writing, with grace and appreciation but come on, who am I kidding? On a really bad day I handle it with some tears, a long run, and/or with chocolate. Okay, and maybe a little TLC from my pup. Gosh, it sounds like a horrible cliché post-breakup regiment! Apparently criticism’s the new ex.. I mean, the new black? I’m a creation of two ethnicities and I grew up in a place where the communities were also multi-ethnic, similar to the melting pot in New York. I’m a bi-product of Korean and Eastern European descent, growing up in complex and diverse surroundings such as Los Angeles and Detroit. People should read my book because I am a crime writer but also a photographer and figure skating coach with a BA in Criminal Justice. If you enjoy unique stories, distinct settings and intricate characters along with a gruesome yet thrilling cat-and-mouse cop story, then this is the book for you! Because I like it better than the alternative. Thank you Suzanne for taking the time to answer my questions & the best of luck with your new book! When Lily Dietz, an ambitious yet short-tempered Asian-American NYC homicide detective, and longtime partner John Fremont begin to work a unique but gruesome murder case, cryptic clues in the evidence start to link with Lily’s dark and troubling past—one deeply imprinted with many psychological and emotional issues. Soon the game of cat-and-mouse becomes a thrilling chase from beginning to end, where Lily’s reality and the people in it begin to doubt her, not only as a detective but as a person. Who will be able to save this damaged soul? Or who will be the one to destroy it?